Histidine (abbreviated as His or H; encoded by the codons CAU and CAC) is an α-amino acid that is used in the biosynthesis of proteins. It contains an α-amino group (which is in the protonated –NH3+ form under biological conditions), a carboxylic acid group (which is in the deprotonated –COO− form under biological conditions), and an imidazole side chain (which is partially protonated), classifying it as a positively charged amino acid at physiological pH. Initially thought essential only for infants, longer-term studies have shown it is essential for adults also. Histidine was first isolated by German physician Albrecht Kossel and Sven Hedin in 1896. It is also a precursor to histamine, a vital inflammatory agent in immune responses. The acyl radical is histidyl. The conjugate acid (protonated form) of the imidazole side chain in histidine has a pKa of approximately 6.0. This means that, at physiologically relevant pH values, relatively small shifts in pH will change its average charge. Below a pH of 6, the imidazole ring is mostly protonated as described by the Henderson–Hasselbalch equation. When protonated, the imidazole ring bears two NH bonds and has a positive charge. The positive charge is equally distributed between both nitrogens and can be represented with two equally important resonance structures. As the pH increases past approximately 6, one of the protons is lost. The remaining proton of the now-neutral imidazole ring can reside on either nitrogen, giving rise to what are known as the N1-H or N3-H tautomers. The N3-H tautomer, shown in the figure above, is protonated on the #3 nitrogen, farther from the amino acid backbone bearing the amino and carboxyl groups, whereas the N1-H tautomer is protonated on the nitrogen nearer the backbone. When both imidazole ring nitrogens are protonated, their 15N chemical shifts are similar (about 200 ppm, relative to nitric acid on the sigma scale, on which increased shielding corresponds to increased chemical shift). NMR shows that the chemical shift of N1-H drops slightly, whereas the chemical shift of N3-H drops considerably (about 190 vs. 145 ppm). This indicates that the N1-H tautomer is preferred, it is presumed due to hydrogen bonding to the neighboring ammonium. The shielding at N3 is substantially reduced due to the second-order paramagnetic effect, which involves a symmetry-allowed interaction between the nitrogen lone pair and the excited π* states of the aromatic ring. As the pH rises above 9, the chemical shifts of N1 and N3 become approximately 185 and 170 ppm. An entirely deprotonated form of the imidazole ring, the imidazolate ion, would be formed only above a pH of 14, and is therefore not physiologically relevant. This change in chemical shifts can be explained by the presumably decreased hydrogen bonding of an amine over an ammonium ion, and the favorable hydrogen bonding between a carboxylate and an NH. This should act to decrease the N1-H tautomer preference. Various forms of histidine, showing the unphysiologic high-pH unprotonated form in the very center of the figure (it bears a negative charge, not shown, shared equally between the two nitrogens), and the neutral-pH singly protonated N3-H and N1-H tautomers at the lower left and right respectively. The physiologically relevant low-pH form, with two hydrogens and a positive charge shared equally between the two nitrogens, is not shown in this figure. The imidazole ring of histidine is aromatic at all pH values. It contains six pi electrons: four from two double bonds and two from a nitrogen lone pair. It can form pi stacking interactions, but is complicated by the positive charge. It does not absorb at 280 nm in either state, but does in the lower UV range more than some amino acids. The histidine-bound heme group of succinate dehydrogenase, an electron carrier in the mitochondrial electron transfer chain. The large semi-transparent sphere indicates the location of the iron ion. From PDB: 1YQ3​. 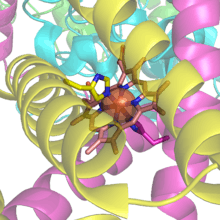 The imidazole sidechain of histidine is a common coordinating ligand in metalloproteins and is a part of catalytic sites in certain enzymes. It has the ability to switch between protonated and unprotonated states, which allows histidine to participate in acid-base catalysis. In catalytic triads, the basic nitrogen of histidine is used to abstract a proton from serine, threonine, or cysteine to activate it as a nucleophile. In a histidine proton shuttle, histidine is used to quickly shuttle protons. It can do this by abstracting a proton with its basic nitrogen to make a positively charged intermediate and then use another molecule, a buffer, to extract the proton from its acidic nitrogen. In carbonic anhydrases, a histidine proton shuttle is utilized to rapidly shuttle protons away from a zinc-bound water molecule to quickly regenerate the active form of the enzyme. Histidine is also important in haemoglobin in helices E and F. Histidine assists in stabilising oxyhaemoglobin and destabilising CO-bound haemoglobin. As a result, carbon monoxide binding is only 200 times stronger in haemoglobin, compared to 20,000 times stronger in free haem. Histidine Biosynthesis Pathway Eight different enzymes can catalyze ten reactions. In this image, His4 catalyzes four different reactions in the pathway. Histidine, also referred to as L-histidine, is an essential amino acid that is not synthesized de novo in humans. Humans and other animals must ingest histidine or histidine-containing proteins. The biosynthesis of histidine has been widely studied in prokaryotes such as E. coli. Histidine synthesis in E.coli involves eight gene products (His1, 2, 3, 4, 5, 6, 7, and 8) and it occurs in ten steps. This is possible because a single gene product has the ability to catalyze more than one reaction. For example, as shown in the pathway, His4 catalyzes 4 different steps in the pathway. Histidine is synthesized from phosphoribosyl pyrophosphate (PRPP), a biochemical intermediate, which is made from ribose-5-phosphate by ribose-phosphate diphosphokinase during the pentose phosphate pathway. The first reaction of histidine biosynthesis is the condensation of PRPP and adenosine triphosphate (ATP) by the enzyme ATP-phosphoribosyl transferase. ATP-phosphoribosyl tranferase is indicated by His1 in the image. His4 gene product then hydrolyzes the product of the condensation, phosphoribosyl-ATP, producing phosphoribosyl-AMP (PRAMP), which is an irreversible step. His4 then catalyzes the formation of phosphoribosylformiminoAICAR-phosphate, which is then converted to phosphoribulosylformimino-AICAR-P by the His6 gene product. His7 splits phosphoribulosylformimino-AICAR-P to form D-erythro-imidazole-glycerol-phosphate. After, His3 forms imidazole acetol-phosphate releasing water. His5 then makes L-histidinol-phosphate, which is then hydrolyzed by His2 making histidinol. His4 catalyzes the oxidation of L-histidinol to form L-histidinal, an amino aldehyde. In the last step, L-histidinal is converted to L-histidine. Just like animals and microorganisms, plants need histidine for their growth and development. Microorganisms and plants are similar in that they can synthesize histidine. Both synthesize histidine from the biochemical intermediate phosphoribosyl pyrophosphate. In general, the histidine biosynthesis is very similar in plants and microorganisms. This pathway requires energy in order to occur therefore, the presence of ATP activates the first enzyme of the pathway, ATP-phosphoribosyl transferase (shown as His1 in the image on the right). ATP-phosphoribosyl transferase is the rate determining enzyme, which is regulated through feedback inhibition meaning that it is inhibited in the presence of the product, histidine. Histidine is one of the amino acids that can be converted to intermediates of the tricarboxylic acid (TCA) cycle. Histidine along with other amino acids such as, proline and arginine, takes part in deamination, a process in which its amino group is removed. In prokaryotes, histidine is first converted to urocanate by histidase. Then, urocanase converts urocanate to 4-imidazolone-5-propionate. Imidazolonepropionase catalyzes the reaction to form formiminoglutamate (FIGLU) from 4-imidazolone-5-propionate. The formimino group is transferred to tetrahydrofolate, and the remaining five carbons form glutamate. Overall, these reactions result in the formation of glutamate and ammonia. Glutamate can then be deaminated by glutamate dehydrogenase or transaminated to form α-ketoglutarate. The histidine amino acid is a precursor for histamine, an amine produced in the body necessary for inflammation. 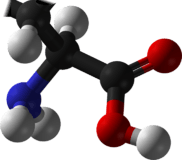 The enzyme histidine ammonia-lyase converts histidine into ammonia and urocanic acid. A deficiency in this enzyme is present in the rare metabolic disorder histidinemia, producing urocanic aciduria as a key diagnostic symptom. Histidine is also a precursor for carnosine biosynthesis, which is a dipeptide found in skeletal muscle. In Actinobacteria and filamentous fungi, such as Neurospora crassa, histidine can be converted into the antioxidant ergothioneine. Supplementation of histidine has been shown to cause rapid zinc excretion in rats with an excretion rate 3 to 6 times normal. ↑ Kopple, J D; Swendseid, M E (1975). "Evidence that histidine is an essential amino acid in normal and chronically uremic man". Journal of Clinical Investigation. 55 (5): 881–91. doi:10.1172/JCI108016. PMC 301830 . PMID 1123426. ↑ Vickery, Hubert Bradford; Leavenworth, Charles S. (1928-08-01). "ON THE SEPARATION OF HISTIDINE AND ARGININE IV. THE PREPARATION OF HISTIDINE". Journal of Biological Chemistry. 78 (3): 627–635. ISSN 0021-9258. ↑ Roberts, John D. (2000). ABCs of FT-NMR. Sausalito, CA: University Science Books. pp. 258–9. ISBN 978-1-891389-18-4. ↑ Mrozek, Agnieszka; Karolak-Wojciechowska, Janina; Kieć-Kononowicz, Katarzyna (2003). "Five-membered heterocycles. Part III. Aromaticity of 1,3-imidazole in 5+n hetero-bicyclic molecules". Journal of Molecular Structure. 655 (3): 397–403. Bibcode:2003JMoSt.655..397M. doi:10.1016/S0022-2860(03)00282-5. ↑ Wang, Lijun; Sun, Na; Terzyan, Simon; Zhang, Xuejun; Benson, David R. (2006). "A Histidine/Tryptophan π-Stacking Interaction Stabilizes the Heme-Independent Folding Core of Microsomal Apocytochrome b5Relative to that of Mitochondrial Apocytochrome b5". Biochemistry. 45 (46): 13750–9. doi:10.1021/bi0615689. PMID 17105194. ↑ Blessing, Robert H.; McGandy, Edward L. (1972). "Base stacking and hydrogen bonding in crystals of imidazolium dihydrogen orthophosphate". Journal of the American Chemical Society. 94 (11): 4034–4035. doi:10.1021/ja00766a075. ↑ Katoh, Ryuzi (2007). "Absorption Spectra of Imidazolium Ionic Liquids". Chemistry Letters. 36 (10): 1256–1257. doi:10.1246/cl.2007.1256. ↑ A. Robert Goldfarb; Saidel, LJ; Mosovich, E (1951-11-01). "The Ultraviolet Absorption Spectra of Proteins". Journal of Biological Chemistry. 193 (1): 397–404. PMID 14907727. 1 2 Ingle, Robert A. "Histidine Biosynthesis". The Arabidopsis Book. 9: e0141. doi:10.1199/tab.0141. PMC 3266711 . PMID 22303266. 1 2 Alifano, P; Fani, R; Liò, P; Lazcano, A; Bazzicalupo, M; Carlomagno, M S; Bruni, C B (1996-03-01). "Histidine biosynthetic pathway and genes: structure, regulation, and evolution.". Microbiological Reviews. 60 (1): 44–69. ISSN 0146-0749. PMC 239417 . PMID 8852895. 1 2 Kulis-Horn, Robert K; Persicke, Marcus; Kalinowski, Jörn (2014-01-01). "Histidine biosynthesis, its regulation and biotechnological application in Corynebacterium glutamicum". Microbial Biotechnology. 7 (1): 5–25. doi:10.1111/1751-7915.12055. ISSN 1751-7915. PMC 3896937 . PMID 23617600. ↑ Adams, E. (1955-11-01). "L-Histidinal, a biosynthetic precursor of histidine". The Journal of Biological Chemistry. 217 (1): 325–344. ISSN 0021-9258. PMID 13271397. ↑ "Understanding Genetics". genetics.thetech.org. Retrieved 2016-05-19. ↑ Stepansky, A.; Leustek, T. (2006-03-01). "Histidine biosynthesis in plants". Amino Acids. 30 (2): 127–142. doi:10.1007/s00726-005-0247-0. ISSN 0939-4451. PMID 16547652. ↑ Cheng, Yongsong; Zhou, Yunjiao; Yang, Lei; Zhang, Chenglin; Xu, Qingyang; Xie, Xixian; Chen, Ning (2013-05-01). "Modification of histidine biosynthesis pathway genes and the impact on production of L-histidine in Corynebacterium glutamicum". Biotechnology Letters. 35 (5): 735–741. doi:10.1007/s10529-013-1138-1. ISSN 1573-6776. PMID 23355034. ↑ Coote, J. G.; Hassall, H. (1973-03-01). "The degradation of l-histidine, imidazolyl-l-lactate and imidazolylpropionate by Pseudomonas testosteroni". Biochemical Journal. 132 (3): 409–422. doi:10.1042/bj1320409. ISSN 0264-6021. PMC 1177604 . PMID 4146796. ↑ Mehler, A. H.; Tabor, H. (1953-04-01). "Deamination of histidine to form urocanic acid in liver". The Journal of Biological Chemistry. 201 (2): 775–784. ISSN 0021-9258. PMID 13061415. ↑ Andersen, Hjalte H.; Elberling, Jesper; Arendt-Nielsen, Lars (2015-09-01). "Human surrogate models of histaminergic and non-histaminergic itch". Acta Dermato-Venereologica. 95 (7): 771–777. doi:10.2340/00015555-2146. ISSN 1651-2057. PMID 26015312. ↑ Derave, Wim; Everaert, Inge; Beeckman, Sam; Baguet, Audrey (2010-03-01). "Muscle carnosine metabolism and beta-alanine supplementation in relation to exercise and training". Sports Medicine (Auckland, N.Z.). 40 (3): 247–263. doi:10.2165/11530310-000000000-00000. ISSN 1179-2035. PMID 20199122. ↑ Fahey, Robert C. (2001). "Novelthiols Ofprokaryotes". Annual Review of Microbiology. 55: 333–56. doi:10.1146/annurev.micro.55.1.333. PMID 11544359. ↑ R M Freeman; Taylor, PR (1977-04-01). "Influence of histidine administration on zinc metabolism in the rat". The American Journal of Clinical Nutrition. 30 (4): 523–7. PMID 851080. ↑ Wensink, Jan; Hamer, Cornelis J. A. (1988). "Effect of excess dietary histidine on rate of turnover of65Zn in brain of rat". Biological Trace Element Research. 16 (2): 137–50. doi:10.1007/BF02797098. PMID 2484542.